The city of lakes,Udaipur, is perhaps one of the most beautiful and romantic cities of India. In contrast with its desert neighbourhood, it stands out with its enchanting image of white marble palaces, placid blue lakes, gardens, temples surrounded by hills and mountains. It is an oasis of colour in the stark arid region and so indeed is the Venice of east.Udaipur is the jewel of Mewar, a kingdom ruled by the Sisodia dynasty for 1200 years. It is said that this city was founded by Maharaja Udai Singh at the advice of a hermit whom he met at the lake Pichhola during a hunting expedition. The city was built in 1559 A.D. and was named after Udai Singh. He died in 1572 A.D. He was succeeded by his son Maharana Pratap (1572 - 97), who defended the city from many attacks of the Mughals. After the Mughals it was the Marathas attacked the city. Rana Pratap as he is known, was a great warrior and lived in troubled times.An end to the bloody battles came with the British intervention in the early 19th century, when a treaty was signed to protect the city from any further attacks. Later, after independence, like all other princely states, Udaipur too became a part of the United India. Location: Located in the Aravali ranges of Rajasthan, the city of Udaipur is situated at a distance of about405kms from the state capital of Jaipur. The city is well connected by air, rail and road to other important cities of India like Jaipur,Mumbai and Delhi.If Jaipur is study in pink, then Udaipur is vision in white. The city of dawn, surrounded by the ancient Aravali mountains and set on the edge of three lakes, is a brilliant Kaleidoscope of narrow lanes flanked by bright stalls, gardens, lakes, palaces and temples. 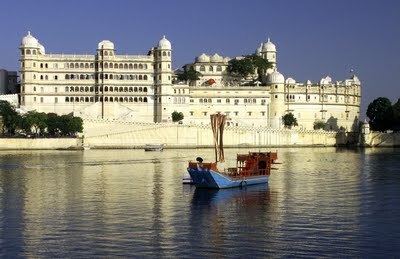 City palace is a complete white structure, standing majestically on a hill and the largest palace complex of Rajasthan. This enormous structure is 30.4 meters in height and 244 meters in length and was started by Udai Singh and subsequently built by later rulers. The entrance to this palace is through Hathi pol or the Elephant gate, along the main street of the old city. The Bara pol or the big gate opens into the first court which leads to the Tripolia gate which has eight carved marble arches.Then there are series of courtyards overlapping pavilion of terraces, corridors and hanging gardens. There is the Suraj Gokhada, the balcony of the Sun, where the Suryawanshi (sons of the Sun God); Maharanas of Mewar, presented themselves in times of trouble to the people to restore their confidence. The Mor chowk or the peacock courtyard gets its name form the glass decoration it has. The chini chitrashala is noteworthy for its blue and white ceramics, while a series of wall paintings on Lord Krishna are on display in the Bhim Vilas palace. Built in1651 A.D. by Maharana Jagat Singh, this Indo - Aryan temple is the largest and the most beautiful temple of Udaipur with noteworthy sculpted images. Alligators, Elephants, horsemen and celestial musicians are seen on the exterior. It is a gigantic construction and is just like a Hindu iconography school. Temples of Eklingji and Nathdwara are known as the most sacred pilgrims in Mewar. The most enchanting tourist attraction of Udaipur, the Lake Palace (also known as Jag Niwas) is a beautiful island palace built by Maharana Jagat Singh II in 1754. Situated on picturesque Lake Pichola, the white marble structure appears like emerging out of the shimmering blue waters on the lake, creating a spellbound effect on visitors. The Lalit Laxmi Vilas PalaceLaxmi Vilas Palace Hotel located at the bank of Fateh Sagar lake enjoys a picturesque view of the lakes, Aravalli Hills and Sajjangarh Palace. The hotel was built by Maharana Bhupal Singh originally in 1911 as a residence of Mr. Winn Gate political agent at that time and in 1945 Mr. Winngate was shifted to Hathi Pole and the Laxmi Vilas Palace was rebuilt as a royal guest house to house the dignitaries, visiting princes and British officers. In 1966 the Laxmi Vilas Palace was transferred to DOT and in 1969 it was handed over to ITDC. 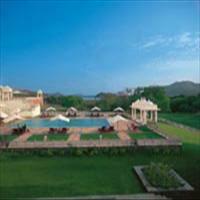 Ever since Laxmi Vilas Palace was run under the banner of Ashok Group of Hotels. The hotel Laxmi Niwas Palace expanded in two phases, firstly in 1977, 23 rooms were added to the existing 11 and in 1984, 20 more were added, thus taking total number of rooms to 55 (44 regular rooms and 11 suites) the banquet hall was also added during this period. The Taj Lake Palace is a marble fantasy that floats magically on the still blue waters of Lake Pichola. The hotel has 83 rooms including 17 suites, some of which are breathtakingly beautiful. 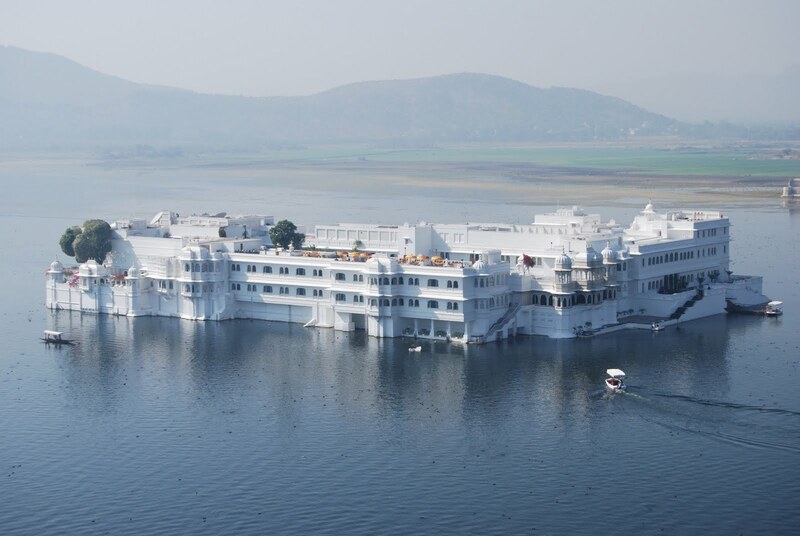 The Taj Lake Palace is located 26 km from the Udaipur airport and a kilometre from the city centre. Trident Hilton Udaipur is located on the banks of the picturesque Pichola Lake and is ten minutes drive from the city center. Forty three acres of land with lush green landscaping surrounds the hotel.The hotel provides a perfect base to explore the fabled city of Udaipur, acclaimed worldwide for its beautiful lakes, medieval palaces and colourful bazaars. All rooms are furnished in shades of indigo blue and gold. The architecture reflects the ancient heritage of Udaipur city. The Oberoi Udaivilas stands on the banks of Lake Pichola facing Udaipur, with views across the water to the 17th Century palaces of Jagmandir and Jagniwas. Udaivilas took ten years to build.A fabulous resort hotel set among thirty acres of former hunting grounds, Udaivilas itself is nothing short of palatial. A pristine version of an original Rajasthani Mewari moated palace, Udaivilas incorporates every conceivable modern comfort.Visual treats include open-air colonnades flanked by 450 hand-carved stone columns. Domes covered in gold leaf. Hand-painted murals, arches and fountains. Landscaped terraces and acres of white marble. A decorative pool of giant marble lotus flowers. And, a treat for all the senses, a superb banyan Tree Spa. A crescent adorning the southern end of the Palace complex, the Shiv Niwas Palace Hotel Udaipur was originally Maharana Fateh Singhji's residence. The rooms around this awe-inspiring courtyard were used as a place for entertaining personal guests. Shiv Niwas Palace Hotel Udaipur was the vision of the His Late Highness Maharana Bhagwat Singhji Mewar, which led to its conversion into a luxury hotel. Shiv Niwas Palace Hotel Udaipur is now categorised as a Grand Heritage Palace as it has been restored to its original pristine glory.